Elizabeth David understood all too well the dangers of good soup, complaining of the temptation to accept second – even third – helpings for fear of ruining your appetite for the rest of the meal. 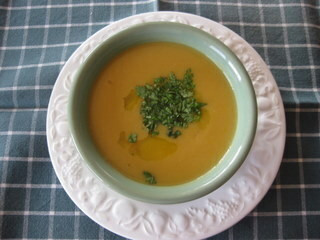 The best plan (especially after the Christmas excesses, ouch) is to give soup pride of place – it’s a meal in itself. Serve it with good country-style bread and a sliver or three of decent cheese. Here’s a selection of dangerously good ones. If you’re nervous about fennel tasting too strongly of aniseed, don’t be: here the flavour is tamed by the addition of carrots and potatoes, smoothed out with a little cream and sweetened by the mussels. A bit of Thai inspiration for this one, between the lemongrass and the coconut milk. It’s perfect for winter and great for entertaining as it can be prepared well ahead. There’s no getting round sieving the soup – sorry – on account of the fibrous lemongrass stalks. Jerusalem artichokes (topinambours in French) – knobbly, pinkish-brown and nothing at all to do with regular (globe) artichokes – have a wonderful earthy, nutty, sweetish flavour, great in soup, mixed roast vegetables or gratins. Their only drawback (the fearsome wind they provoke) is forgivable because they taste so darn good. A brilliant winter broth of beans and tomatoes with a garnish of crunchy tortilla chips, avocado and fresh coriander (cilantro). The soup keeps several days with good refrigeration and freezes beautifully. A great seasonal soup using a mixture of veggies. The garnish of vegetable crisps/chips looks gorgeous and brings a nice crunchy dimension. Cream (or coconut milk) at the end is an optional flourish – depends a bit on the rest of your menu.